I was recently asked to partner with Scott Trent of the Henderson Art Project to create a 2D work for the traditionally 3D event. The final piece "Breathe–Swirling Eddie XXIV" was created for the 2011 event. I myself have benefited greatly from learning how different artists think and create. I think I have blogged in the past about my love of the PBS series Art21 and the documentary Painters Painting where we get to look at art through those creating it. With that in mind I decided to document my recent work for the Henderson Art Project so that I could exercise my blog muscle. 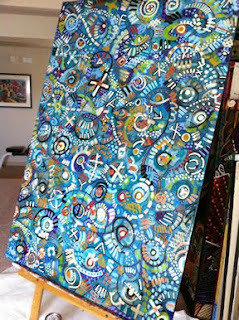 The Swirling Eddies series is a series of paintings I have been working on for many years. I really enjoy this series because it encompasses all that I love about painting. Since this piece of work for the Henderson Art Project will be displayed outdoors for many months it needs to be made of something that can withstand the ever changing weather in Texas. Therefore, the substrate for this painting is 4'x 6' premium plywood primed. Plywood is definitely something that I haven't painted on in quite some time. The cool part of this project is that Scott provided a real nice grade of plywood with a real smooth and clean surface. Another bonus was that he delivered it pre-primed! I was excited about this project because it was going to be the first art project where I would be able to collaborate with Scott Trent. The Henderson Art Project has traditionally been a sculpture only event, but with the use of Scott's awesome uber easels now 2D artists can also get involved. If you are not familiar with the project you can learn more at their Facebook page or their Website. Scott has done a wonderful job at organizing and evangelizing the project, as well as providing encouragement to those artists he meets along the journey (I being one of those :). This is one of Dallas' premiere public arts projects and a lot of that is due to Scott's dedication and leadership. 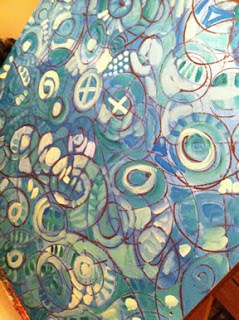 Now back to the painting...When starting out on Swirling Eddies I like to create a an interesting foundation of color or pattern. 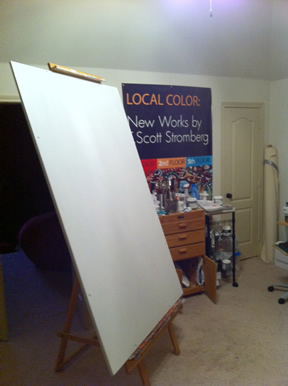 In this work I knew I wanted to create a color field of cool colors. So I used another one of my painting for a reference and created a base color palette. 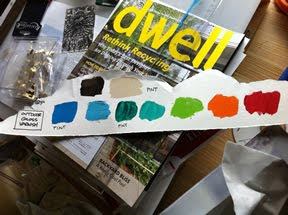 I took this palette over to the local hardware store and had them match the colors (we decided since this was going to be outside I would use latex house paint on the painting). TIP: I had them all made into sample sizes. Since I new I was going to gloss varnish the final piece to protect it from the elements I wasn't as concerned with the finish of the paint and budget is always a consideration. Once I started painting I realized that the consistency and weight of house paint is no where near what I was use to using acrylic paints. 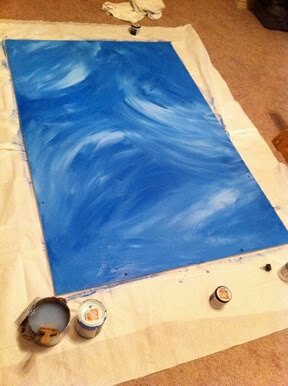 Although on this stage of the piece I was more interested in blending the background colors. Since I wasn't sure how long the drying time might be with the latex paints I decided to add a bit of dishwashing soap to the paint to extend the drying time (I actually learned about this trick while watching a home show on TV-Heh!). I was pleased with the way the blend actually turned out. 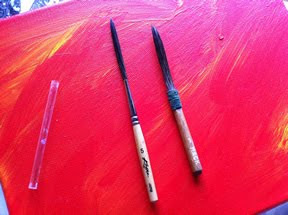 For the next phase of the work I get to use one of my favorite brushes- The pin-striping brush. These brushes were what originally created the Swirling Eddie painting series. I have always loved the "mystic spiral" and once I got my hands on one of these brushes I felt set free! I know this will sound a bit kooky but these brushes are almost mystical. There is something very primitive and cathartic about creating the swirls. Almost like the time back in college where we spent a night filling our studio with "ensos" (but that's another story entirely). I tend to almost always use either Burnt Umber or VanDyke Brown Hue when creating the swirls. I think the main reason for this is that in some ways they feel rooted in nature and the brown tones help link the swirls to the earth and soil. In earlier works I use to use a lot of black but along the way I moved away from black to browns. There seems to be an antiquity of presence and a deeper connection with the organic that comes from the use of browns. 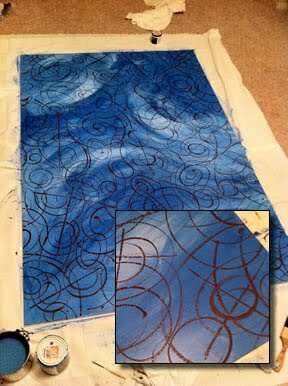 Very much like the background color fields discussed earlier, the swirls become another anchor or foundation for the painting. Just like concrete and rebar the color-field background anchors the swirls so that they can support the color, symbolism, and allegory of the final work of art. Due to the randomness of the swirls the artwork emerges from some primal and often subconscious actions. Thus the foundation of the work is rather automatic. The next layer in the work involves adding and blending the shades that make up the middle-ground of the artwork. This is often a very laborious yet important aspect of the work. Using the foundations created by the background and swirls, color is added to strengthen the aesthetic and compositional structure of the work. Weaving light and dark tones in and out of the swirls–carefully bonding color and pattern to the existing substructure of the painting. All in an effort to unify the many layers and colors existing within the work of art. It is also within this layer of the painting that an antiquing or stain effect might be added. This effect allows for more richness in tonal values as well as adding a more earthy antiquity to the work. Often color is rebuilt over the stained paint to increase color balance and interest. In many past works in this series this is where the construction might end, but in this case more layers of symbolism, patterning, and visual noise were added. Upon completion the work of art was covered with many coats of MinWax Helmsman varnish to help aid in it's protection against the outdoor elements. I traditionally don't varnish my work but I must say it turned out pretty neat! 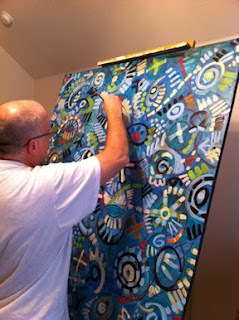 You can view the installation of the work on the Henderson Art Projects Facebook page. I want to give another shout out to my lovely wife Sammie who assisted Scott and I during the install by documenting it in its entirety on digital film. She is blessed with the ability to take awesome photos–a gift I do not possess! I hope you enjoyed reading about my process. If you are a 3D or 2D artist who would like to no more about Scott Trent and the Henderson Art Project 2011 please check out there Facebook page.